Proof that I did knit (and quilt) while Gorgeous Man was away. 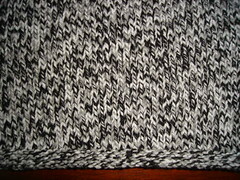 This is a Debbie Bliss pattern, with two strands of local yarn held together. It’s pretty cute and I’ll probably end up making one for me. This is destined for a friend who is due any day now (we’ve been saying that for the last 2 weeks). I’m waiting to see if the child is a boy or a girl before sewing on buttons. I’m currently knitting a baby v-necked jumper for my baby. This is the back, and this is a close-up of the yarn. This is local yarn. We had another appointment with the Ob/Gyn yesterday and another scan – picture will be uploaded when it’s been digitalised. I was pleased to discover that I can hire a TENS machine for labour, and a new maternity shop has opened this week in our area. We drove straight there and came home with some clothes – pictures to follow. Tomorrow is Freedom Day – celebrating the first multi-racial elections in South Africa in 1994 that brought an end to apartheid and elected Nelson Mandela to power. We are going to take advantage of the long weekend and visit Ado Elephant park (about 4 – 5 hours away) and spend the weekend there. Hopefully we’ll have good weather and there’ll be lots of pictures when I return. Gorgeous Man made it home safely last night, a little tired and worn out, but in one piece. I have to admit I felt a little like a member of a cargo cult once he started unpacking and passing on gifts. 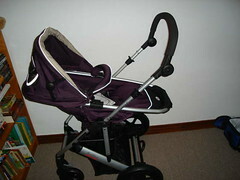 The getting of this pram is a whole blog post on its own. I will say here a huge thanks to Gorgeous Man’s online friend W who consented to have it (and assorted other goodies) sent to his house. 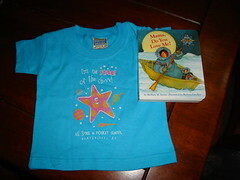 A t-shirt from the space centre in Huntsville, Alabama and a book (of course) from the Native American Museum in Washington DC. We are collecting quite a few books that tell stories from around the world, and this one is just lovely. 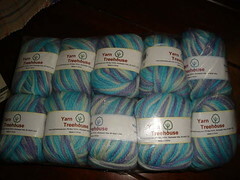 10 balls of Yarn Treehouse. This is going to be a diagonal baby blanket. It’s a bit chunkier than I anticipated, so I have to go and buy some enormous sticks fatter needles. “I cannot live without books” Truer words were never said. I suspected that Gorgeous Man had made a trip to a LYS in DC when he left a comment on the blog saying that it wasn’t too cold. He out-did himself. 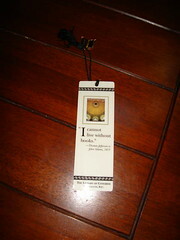 Mulberry silk – 5 balls of it. 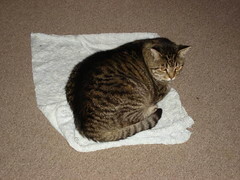 I’m thinking some sort of lace shawl. I’m new to lace knitting so any ideas and pattern suggestions would be most welcome. 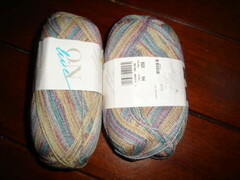 Gorgeous Man did suggest a baby blanket, but this yarn is all mine. However, the best present was just having him home. With the return of the camera there will be some Finished Objects and Works in Progress tomorrow. Gorgeous Man is due home tonight. I’m a bit excited. He’s bringing me some cool stuff, so there’ll be some pictures tomorrow. I had a nice quiet weekend at home working on various projects. I got some knitting for a jumper for the offspring done, I worked on a sock for charity, I got some more of the giraffe quilt block stitched down and I started a crochet blanket for the pram. Since Gorgeous Man is bringing back the camera tonight there will be pictures of all projects soon. I also finished book number 21 for the year. 21. Mao – The Unknown Story – by husband and wife team Jung Chang and Jon Halliday. They certainly had access to a very impressive range of people and sources. Because Jung Chang is a novelist this reads more like a novel than a historical biography and there are some claims that cannot possibly be verified, such as stress over Mao caused Stalin’s fatal stroke in 1953, and that Mao was the inspiration behind the Berlin Wall. On the whole though a very sobering read, the sheer number of lives lost boggles the mind – 70 million dead as a direct result of Mao’s policies during his lifetime. This number is a little higher than many historians allow. This book will appeal to the general reader and the historian. This is only going to get worse right? 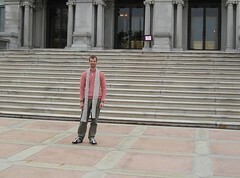 This is him on the steps of the Library of Congress – where he spent most of his time while in DC. Proof that there are some signs of spring about. 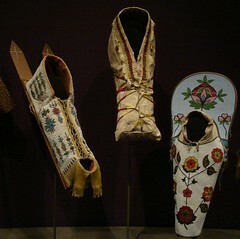 And some pictures from the museum he visited on the weekend, note the sewing content. Today he heads for Alabama, and the conference which is the purpose of the trip. Self imposed rotation of crafts continues to work well. Yesterday was quilt day I worked on a giraffe block. Starfish I can’t tell you what a difference having those proper applique needles that you sent in the Favourite Colour Swap makes! Thank you once again. I only got half the block appliqued down though as I was feeling a little weary and ill and went to bed early. I then spent half the night up with (what they call here) a running stomach…Not feeling too crash hot this morning, but I should be able to make it through the day. I probably won’t make it to choir rehearsal though. Tonight is knitting for charity night and I’m working on the second sock for Hottentots Holland Hospital Helpers. 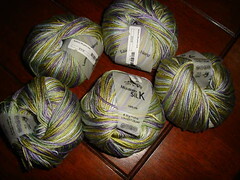 This was gifted by Shelly and was some of the yarn she was inundated with when the Yarn Harlot asked knitters to bury her house in yarn. Yesterday was “Knitting for me day”. I pulled out the yarn stash (yes, my entire stash of personal yarn is contained in one plastic tub), and after much deliberation decided on a yarn (black, white and grey plied together – I’ll need to get some more though, what a shame, another trip to the yarn store) and a pattern: a simple v-necked jumper for the offspring. 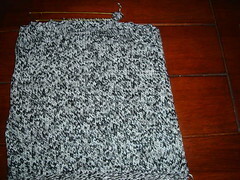 I actually knitted a tension square. I know it is called a gauge swatch elsewhere, but in this case tension square suits it perfectly. I needed 22 stitches to 10cm. I got 20, so I switched to smaller needles, next size down and got 24, back up to the original needles and got 23. One stitch on a baby’s sweater won’t matter right? Right? So I got lots of knitting done, but not much on the actual jumper. Tonight is quilting night (under my new self-imposed rotation of projects). 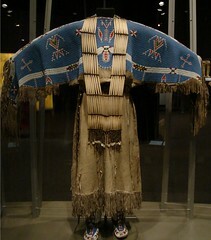 I’m girding my loins to attack the applique again. But first I have to put away the yarn stash and assorted knitting tools, vacuum and do a load of dishes. Don’t you hate it when reality interferes with crafting? I’m enjoying the applique process, I find it very relaxing, but my results, to be honest, are less than stellar. My next-door neighbour quilts – sometimes (she’s in the process of finishing a quilt top she started 20 years ago – she does lots of embroidery and stuff like that), anyway she came over yesterday with 2 metres of material she found in the fabric store that she couldn’t resist – for the offspring. I don’t know what I’m going to do with it. When I get the camera back I’ll post a picture here and ask for ideas. Fat Boy is not a smoocher. He loves to be brushed, but being picked up and held, or snuggling on a lap is not his thing. Occasionally he will scoot between the two of us on the couch or sit on Gorgeous Man’s lap, but not often. All this has recently changed. Since becoming pregnant my cat has had a personality transplant. Every. time. I. sit. down. the cat is wanting to be on my lap. Now that’s not too bad, I can knit or applique around him, most of the time. He usually ignores the yarn or needles and if he gets too interested a simple no usually means that he ignores them again. However, yesterday he went too far, I guess he’s preparing me for the complete lack of privacy that apparently comes with being a parent. He pushed open the bathroom door and tried to sit on my lap while I was in there. TMI? 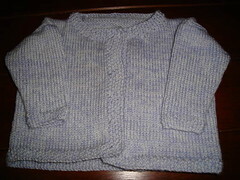 I’ve finished the baby cardigan for my friend who is (literally) due any day. It’s come up well cuffs, neck and button band are in moss (seed) stitch, it’s a Debbie Bliss design, but I knitted it in acrylic I found here, two strands held together, light purple and white. I’m waiting to see if she has a boy or a girl before I add buttons. Pictures to come when Gorgeous Man and my camera return. Not sure I love the pattern enough to repeat it for myself though. I’ve decided to acknowledge that I’m not very good at working on multiple projects. I tend to get obsessed by one thing, so I’ve decided to try an experiment and break the days of the week into different projects that I want to complete, yes I’m a touch OCD. So Monday night is choir rehearsal (no crafting, but I’ll probably knit a few rows before going to bed) and Tuesday night is going to be knitting for me, Wednesday to work on the quilts I want to make for the offspring, and so on and so forth. Hopefully this will increase productivity across the spectrum of crafts. I’ll let you know how it goes. Gorgeous Man is still freezing in DC. In a few days time he’ll be heading to Alabama where, hopefully, it’ll be a little warmer.